It's been my goal for quite some time to get to this colorful people wall. (I'm not sure, however, if they are actually people or if they are strange and colorful creatures from another place!) Regardless, I finally made it to the wall! Last Sunday, we went to a concert in Downtown Los Angeles and this wall turned out to be precisely a 12 minute walk from the theater. (What did I do before Google Maps to plan all of my adventures?) 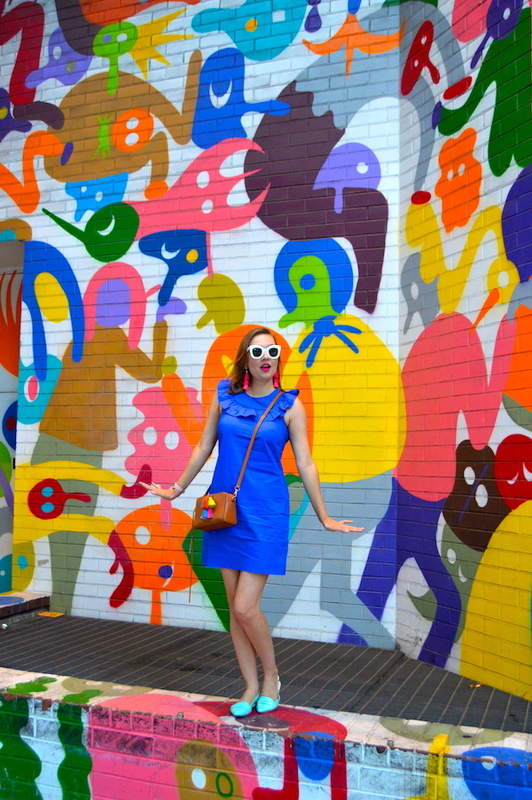 It was the perfect opportunity to visit the colorful party people/colorful creatures! 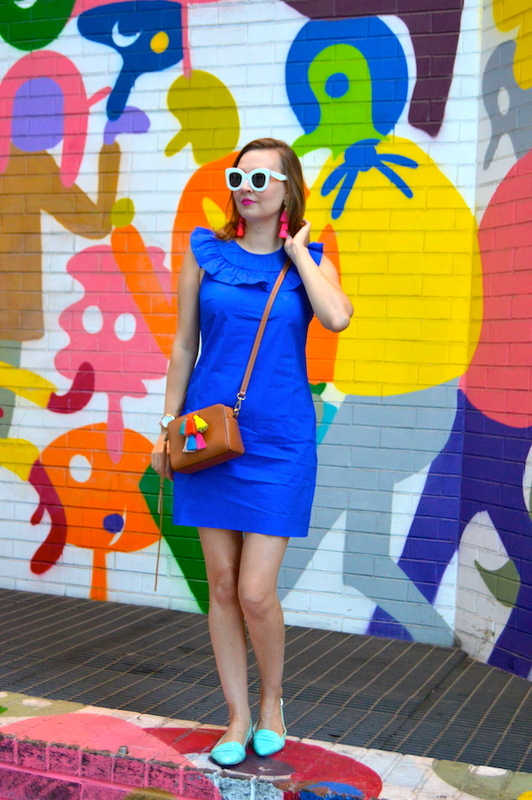 I wore this fun blue dress from J. Crew to the occasion. J. 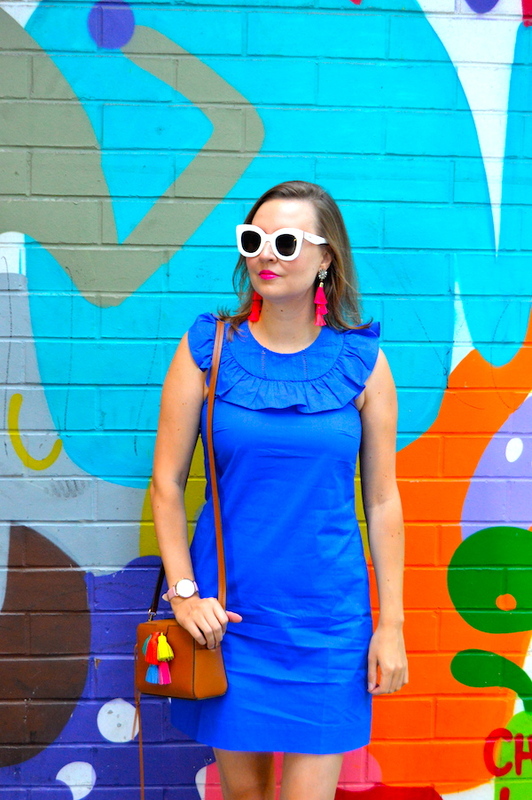 Crew says this dress is a "no brainer" on their website and I can see why, as it offers a fantastic style paired with a lovely color that goes with everything. I decided to add some more color to the look in the form of tassels on both my bag and earrings. I love these tassel earrings that were sent to me courtesy of Rocksbox.They are dramatic and make a bold statement, just like how I am theatrically posing like a damsel in distress in these photos! Best of all, the earrings are super light weight. I love how every month I get to try new styles in jewelry thanks to Rocksbox! If you want to switch up your jewelry game, you can use code Hellokatiegirlblogxoxo for a free one month trial! 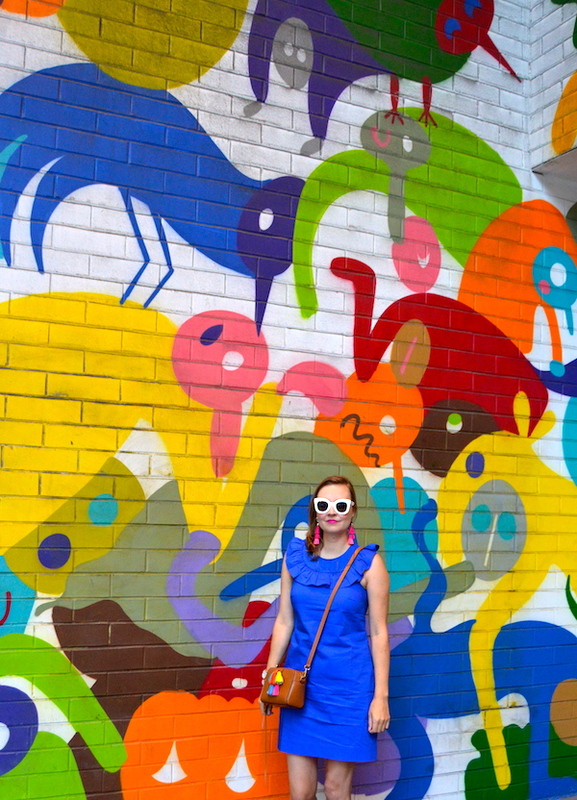 Well, I hope you enjoyed my colorful journey to this part of Los Angeles! You never know what you might find around any given corner in Los Angeles. 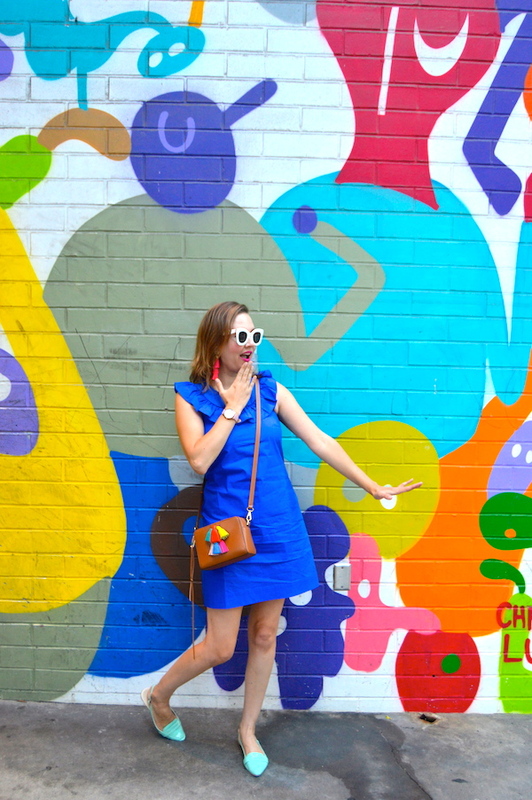 It might be a colorful creation like this wall, a cool dumpling place (like the one we ate at before the concert), or a beautiful historic building that you never noticed before. These are some of the many reasons I love Los Angeles so much! 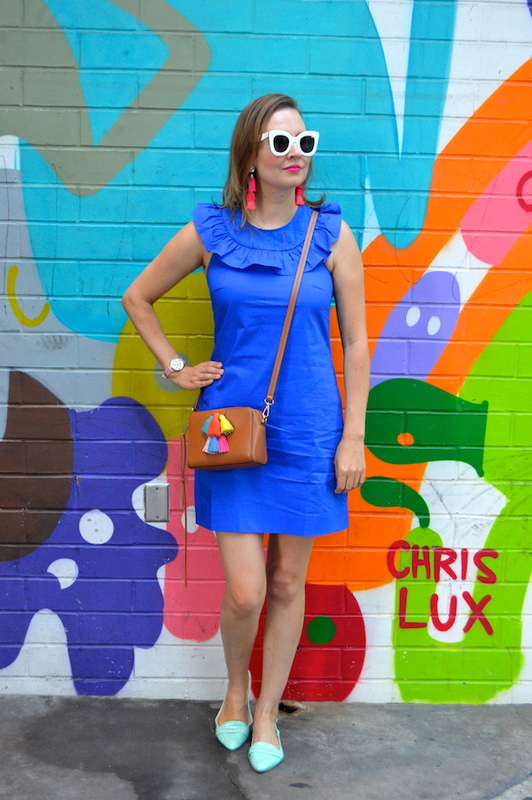 YOu are beautiful in cobalt, and I really like the fun wall, but your accessories are my favourite part of this outfit! What a crazy, fun wall! And your outfit goes with it perfectly! 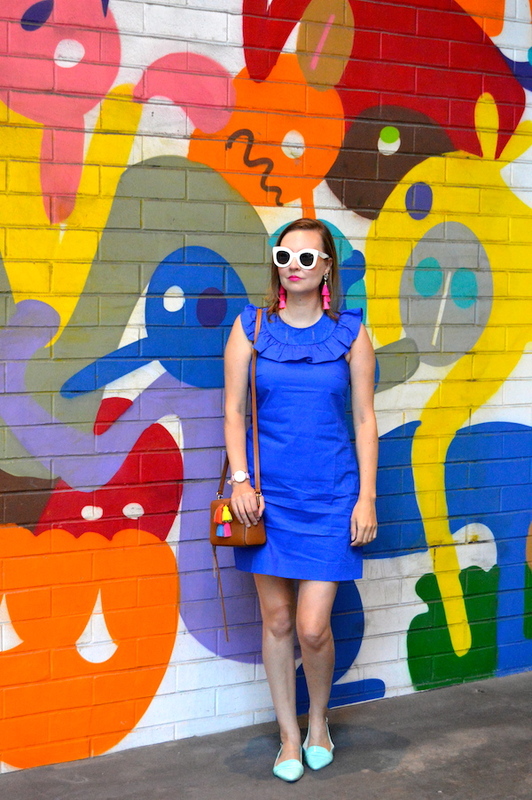 I absolutely love this colorful post, and your outfit is perfect. That blue dress is so lovely! 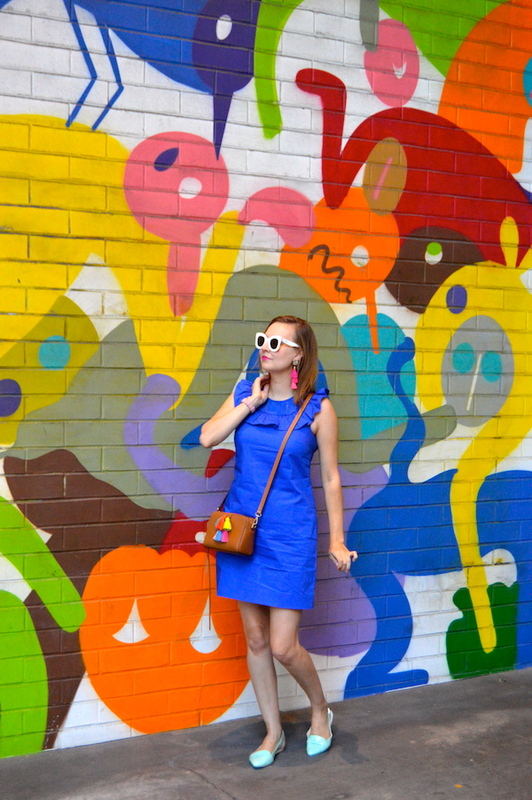 Love your dress and that wall is so fun! I found you on Pink Sole link up! This is such a fun wall Katie! I love it! You always look gorgeous and so bright in your clothes!